The in-game PS Festa events will come to a close during March 9th’s maintenance, so let’s strive to earn the final three Web Panel rewards! The development team has updated the information regarding the upcoming changes to Klotho’s client orders. PSO2 will be holding a campaign to commemorate the 3rd anniversary release of the PlayStation Vita version. Google Authenticator was implemented into PSO2 in order to offer a more stable security system. After confirming stable operation of this service, they decided to push forward a campaign to promote the implementation of the Google Authenticator method. In the upcoming days, they will make another announcement where they plan to add even more presents to the [Continuous OTP Campaign] for players utilizing Google Authenticator. Before switching over to this service, we ask players to read the risks involved when playing overseas, outlined near the top of the OTP Guide. 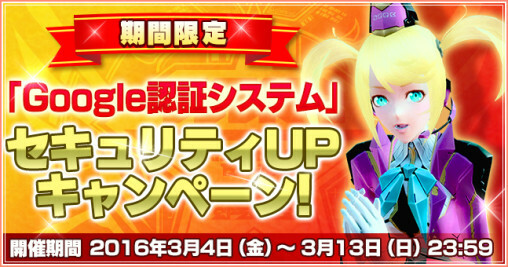 March 4th ~ March 13th @ 23:59 JST. Players who register for Google Authenticator and have it set as the priority OTP service as of March 13th, 23:59 JST. ※ Google認証システム 設定中 radio button must be checkmarked to qualify. Mid March at the visiphone. I thought something was up with the earlier posting. Glad to see they cleared the confusion with klotho’s stuff. Seems like they’re streamlining like i suggested ( making the clears require a number of times instead of several clears on different difficulties) which is better overall. Either way still have to wait and see the update when it’s released; that being said, i think they’re being pretty generous with their 10th anniversary gifts for the web panel prizes (checked it from the link and the prize list is pretty nice). No complaints really besides the slight disappointment at the small meseta earning cut since you can’t make back all of it as the post said (but most of it). Overall the new update can’t come soon enough, new content is always good and interesting. Did I read that right on the Vita anniversary campaign? 100% exp boost and 100% rare drop boost on all quests all week? If so, that’s pretty nice. As someone who plays solo ~80-90% of the time, the boost is greatly helpful to me to level up my lower classes. Especially since on the rare occasion I do show up for something like TD or PD, I do it on my main class for exactly the reason that I *don’t* want to be one of those people. …and since I forgot to point this out and can’t edit my post, I guess I am stuck replying to myself. The nicest thing about this particular boost is that it applies to *all quests*. Meaning, the stuff I usually do solo is included. Also, things like the Tokyo Bonus Quests (which are great for leveling due to Tagami Kazuchi) are included. I’d prefer no stupid whining. Come back after the boost period or play in premade MPAs if you’re too m3641337 for pubs. That’s nice and i prefer people shutting the hell up (substitute hell for the F word), since i’ve personally had to deal with elitist scumbags on the game screaming and calling the rest of the team “trash” or “useless” because we don’t do the 1337 dmg that they want to see. Regardless of whether we have fun or not, and even if we win through team effort (and we always do even if it’s a close win, because teamwork, they still talk alot of smack). Tough talker online make me puke; little immature kids who can’t get over them-self. I had one particular loser type more than do anything during an XH despair run and we still finished with only 1 tower destroyed (one of my best team PuB parties ever). Whatever happened to having fun and enjoying the game; seem’s like most people or the next person is always some pure dirt-bag who acts like they’re better than you. People seriously have no respect and the community is half trashy. I’m really disappointed because when i started PSO2 i thought the community would be amazing and different since its not an english server for one, and different. Nope i got retarded and pure A-grade douche english players, and i also equally got more retarded and pure A-grade douche Japanese players (some of them even cusses at me and others in japanese – thank you google translate) during parties and stuff. Bunch of Effing wankers on this game, the lot of you are. Then i come here on forums and i see more wankers talking alot of smack and being general grade-A douchebags. Have fun being a douche i guess. Uhh it start i guess…. Those people aren’t D-bags. They’re preachers. Preachers call out leechers for being terrible at the game. Most leechers are forever oblivious that they are the main source of cancer. Until these “people” come to REALIZATION for TRUTHHHH then the community will forever be dingdong. No, 420. You are the leechers. And then 420gunner was a cancer. 420GUNNER i don’t see someone who literally wasted half the entire XH Despair run flooding chat with flame and ranting and all caps raging useful either. In fact these “preachers” are just as bad as someone who might not be good at the game and can’t really help the team. Unfortunately people forget logic, even if you’re not an MLGPRO1337 you can still help the team by being a crystal collector or destroying the laser towers that roflcopter the towers. Also do you know what a leecher really is? In games (whether a traditional tabletop RPG, LARPing, or even MMORPG) the term “leech” is given to someone who avoids confrontation and sits out while another player fights and gains experience for the person, or “leecher”, who is avoiding confrontation. Basically AFK’er or trolls who do nothing at all. Just because someone is dying and isn’t MLGPRO1337 doesn’t mean they’re a leecher if they’re doing their best and trying for the team. Anyhow this is just a stupid argument, lets just stop here. I really hoped a Japanese server based game would be better than all the trashy English servers on other games i tried. Too bad it turned out half-cancer. I still have hope since half the people are pretty cool, but the other half are pure cancer. So I actually WAS being helpful every time I collected the crystals instead of fighting? I legitimately had no idea, I was just doing whatever I possibly could to help out. It depends on the situation, and who else is doing what. Not enough crystal gathering and you don’t get enough points for the things you need to activate (turrets, AIS, tower heals) to win. But if too many people are gathering, then there aren’t enough to fight. There are some good guides for this stuff on places like PSOW and others. Reminds me of the time when td4 first came out. That Cloud person comes to mind. Can’t stand that little piece of feces for yelling at people. I think there was another one called Overburst? But yeah, screw those people. Unfortunately, the digger you deep, the more likely you’ll find awful people in the mix. The pre-XH PSO2 days were pretty good times for me ’til I joined my first official team. I couldn’t even do pug magatsu with certain people without having them scream in public chat how the mpa isn’t doing a stomach-only run or something… so embarrassing. I’m sorry your experiences have been distasteful :< I'm glad some sensible players who realize that this is only a game still exist on the server. I tend to call things out. I don’t take it personally if people are undergeared (within reason) or unskilled, I just care when there’s something they should definitely be doing different- like saying ‘why am I the only person using their WB’ during phase 2 of Magatsu, or saying ‘AIS can deal more damage by using their Sword PA instead of just gunning’ during Mining Base.. I’ve legitimately seen AIS stand back and just use their guns instead of doing literally anything else, not even standard sword attacks. I want to win- so do most people, right? Isn’t it justified to get upset when people are being deadweight because they don’t care to do any better, not because they CAN’T? I’ve had people swear at me just for this, and it bugs the hell out of me. Do I really deserve it? Its another “people complain they can’t leech in pub because of other leechers” episode. What’s happening with Xie’s shop after maint? Should I spend badges now or is it just gonna stay like the previous one? It will be moved to the Badge Shop. Ummm i whana know if there will be any more ways to get more medals and still buy stones? im short 300 medals and im afraid 4 hours wont help. Ofc there will. Those are *2016* badges, not “first-quarter-or-so-of-2016” badges. Plus PI and such already reward them. Hurr I can’t understand the Japanese insults at least. Well I’ve never been insulted directly in an MPA anyways so it doesn’t bug me. I also don’t mind advice. I don’t pretend to know everything and a few pointers never hurts. So will there be abrand new lq? Having troubles with Google OTP since yesterday. I kept putting in the correct password as usual, just as I have before. Tried contacting SEGA JP so I will see how it goes.